After more than 6 years without releasing a complete production (I am referring to a big title and great invoice), after resting times for culture and the so-called existential crisis that I do not even like to name … So much speed and excitement that came from the year 1997 that I premiered the claw and the angel; then would come Amargo, Poet in New York, Enramblao, Intimate, Dead Time, Alone and Bitter ?, Love Brujo, Dans Nouveau, Rosso, DQ Passenger in Transit and work with the best artistic and technical teams … I pause for the entertainment, television, cinema, text theater with titles like Precious Stones, Hen … I return to my passion theater and dance with Dionisio, the vine and a thousand nights, a mythical, magical, complex, manipulative character, exciting and for me one of the greatest of Greek mythology without naming himself and that’s why I felt he was masterful for his cunning and background. 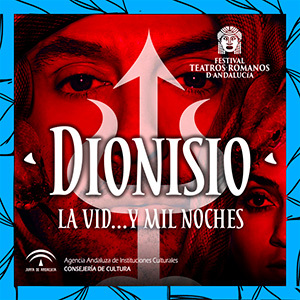 Dionisio made me feel that it was the title to return. 13 dancers, 10 musicians … And in gratitude to the public institutions that award me with Gold Medal of the Fine Arts, Olympic medal in Rio 2016 for my participation and delivery with the Spanish rhythmic gymnastics team. Already to die of love, my land is the medal of Andalusia that this year made me an Andalusian boy who emigrated to the capital of Spain to New York, where I was trained, and to Japan. Back to Andalusia to feel more Andalusian and proud of my birthplace. My prize: the network of Roman Theaters of Andalusia. To thank the Junta de Andalucía for bringing me to dance and to make my Andalusian countrymen dream with a very generous show and very much to thank so much affection and love that I feel for you and my land. Tomatito, his family, the choreographer and national award Ramón Oller, the great star dancer in Argentina, Hernán Piquín, who is here today on stage with me and the masterful score by Malaga native Jesús Durán. * Remember, the venue does not have a ticket collection service. * You can pick up your tickets at any El Corte Inglés Center with ticket service, on dates and hours of service to the public. The tickets must be collected by the cardholder who made the purchase or by the PayPal account holder (or person authorized by the cardholder) presenting the DNI and booking locator. * You can collect your tickets in your own printer. You can print the tickets for this show. Check that it is connected and has consumables available (ink, paper, …). * You can collect your tickets on your mobile. Download them through Passbook (iOS) or Passwallet (Android) and make sure the availability of the phone at the time of accessing the event.